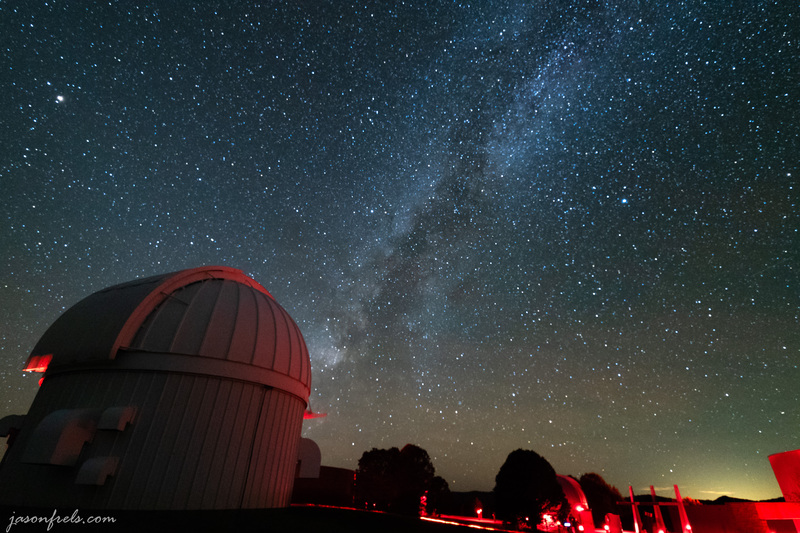 The University of Texas has an observatory in west Texas called the McDonald Observatory. 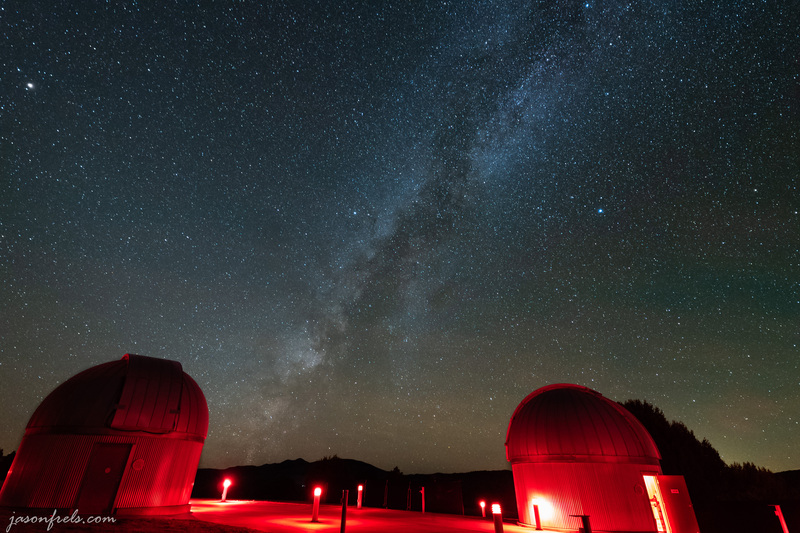 The observatory hosts several star parties a month, in which guest can come see the stars, look through telescopes, and enjoy the dark sky. The kids had a day off of school, so I took the clan half way across Texas to have a star party. 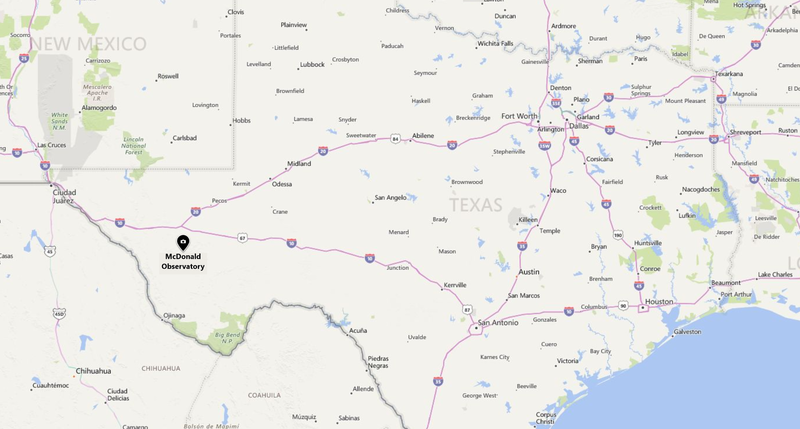 The map below shows where the observatory is in Texas; I live near Austin about 430 miles east of the observatory. 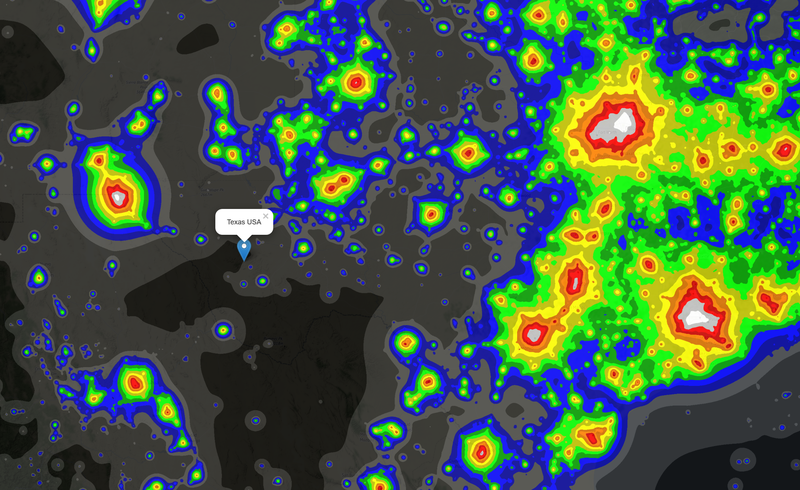 If you look at a light pollution map, you can see why the observatory has to be where it is. Below is an image of a map from darksitefinder.com. In the map, you can see the 2 large metropolises of Houston and Dallas to the right and El Paso/Juarez to the left; the observatory is marked with the “Texas USA” label. 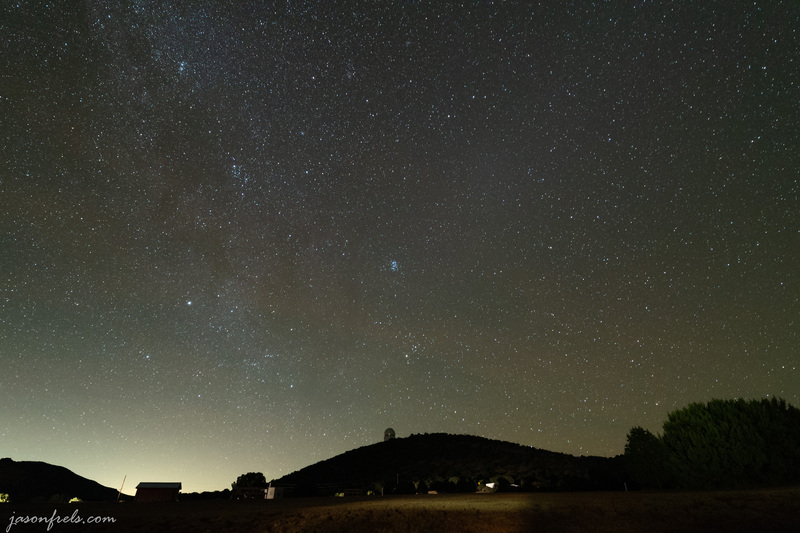 When you arrive in the parking lot of the observatory at night, get out of the car, and look up in the sky you can easily see the Milky Way stretching across the sky overhead. The main telescopes of the observatory sit on some mountain tops. I took the below picture from atop a peak at Davis Mountains State Park, near the observatory, while hiking around the morning following the star party. 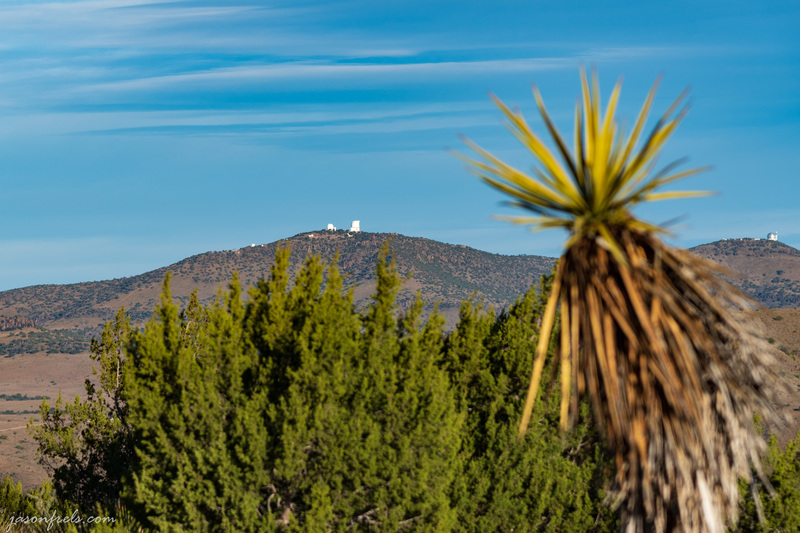 I thought that the yucca in the foreground might make a nice contrast with the observatories on the far mountains. As twilight is fading into night, you arrive at the observatory visitors center and proceed to an amphitheater for a presentation about the night sky. The guide has a laser pointer and points out major constellations, bright stars, etc. It is so delightfully dark out here that the Milky Way is clearly visible across the sky. Mars and Saturn are up, but not in an ideal place to observe. After the presentation, you can go to various telescopes to observe various celestial objects. The Andromeda Galaxy, or M31, is at a high place in the sky and one of the telescopes is trained on it. There was also a telescope trained on the ring nebula and a few other objects. After we were through looking through telescopes, I grabbed my camera out of the car and set up to try to get some shots of the Milky Way with some of the telescopes in the foreground. In the photo below, I have one of the telescope domes in the foreground with the Milky Way above. Everything on the ground is red in color. This is because all of the lighting at the star party is red to reduce the effect on your night vision. You can still see to get around, but your eyes are not overloaded with light. You are also suppose to keep your cell phones put away to avoid ruining your night vision. With the next shot, I tried to position two of the telescopes on either side of the Milky Way. There were actually some people in this scene but they were blurred out by the long exposure. The bright object in the upper left is the planet Mars. Saturn is sinking to the horizon in this photo as it was getting late. I did have to adjust the white balance in these photos. I guess because of the red lit structures, the camera adjusted the white balance too far to the yellow. I had to cool down the image significantly in Lightroom. I also put an exposure mask over the red lit structures and reduced their exposure by about 1 EV as they were really overloading the image. These photos were taken after nearly everyone had gone home. The kids waited patiently, I think, and the people were closing up the telescopes for the evening. They didn’t mind me wandering around with a camera and tripod shooting pictures. The next picture is facing the opposite direction. I was attempting to frame one of the large telescopes up on the mountain with the stars above. Just above the telescope you can see the Pleiades cluster. There is also some light pollution in this direction from the natural gas drilling in the distance. I shot mostly at ISO4000 and ISO5000 with the lens wide open. If you go zooming in, you can see a little movement in the stars, but it is not too bad. I did mostly edit using the same techniques that I discussed in this blog. This was my second star party at this observatory and I think that I probably have more fun than the kids do. I thought that it was worth 7 or 8 hours driving, but I am not sure that everyone else did. A lot of the driving is on Interstate 10 where I could just set the cruise control to about 82 MPH and leave it for a couple of hours, passing the occasional tractor-trailer. My youngest daughter is interested in astronomy, so I try to encourage that. It is really amazing how many stars you can see in a dark location on a clear night after you let your eyes adjust to the dark. Spending most of my days in the city, I stare up in amazement at the sky when I am in a place like this. I am glad that you added that part about your husband driving. I am not very good at picking out the constellations. I have an app on my computer that shows where they all are, but I just don’t see the crab or fish or whatever. I think that thousands of years ago with no light at night, people just had a lot of time to stare at the night sky with no light pollution and could really let their imagination run. Now light is cheap at night. These days you can get great cameras for not much money. They get your money when you buy lenses. It really depends on what you want to shoot. I started off with an entry level DSLR camera and kit lens and moved on from there. Just everyday pictures, or when we go on vacation, be able to shoot with it. We do have the iPhone which hasn’t disappointed, I especially like the portrait option. But would still want a camera. What brand would you recommend? Boy, recommending a brand is a heavy thing. I shoot with Nikon and I am happy. Their big competitor is Canon. They make comparable cameras at similar prices. Both brands have a large amount of followers and fans. I think that they will both give you a fantastic product to shoot photos with and you can’t go wrong with either. They both make larger and smaller DSLRs and Mirrorless cameras. The larger ones are usually called “full frame” because they have a 35mm sensor and the smaller ones are usually called “APS-C” or “crop sensor” which have a smaller image sensor. The advantage of smaller sensor is the smaller, lighter camera and lenses, which can make a big difference walking around. You would be hard-pressed to find much of a difference in image quality except under certain specific circumstances. I got a full-frame mainly because I am interested in night-sky photography and full-frame sensors have a bit better low-light performance. For lugging around with the family, I would be more than happy with the smaller APS-C cameras. Fujifilm and Sony also make these form-factor cameras. I wrote this last fall when I got my newer camera. It compare the crop-sensor camera with the full-frame. Here is a picture comparing the size of the two. 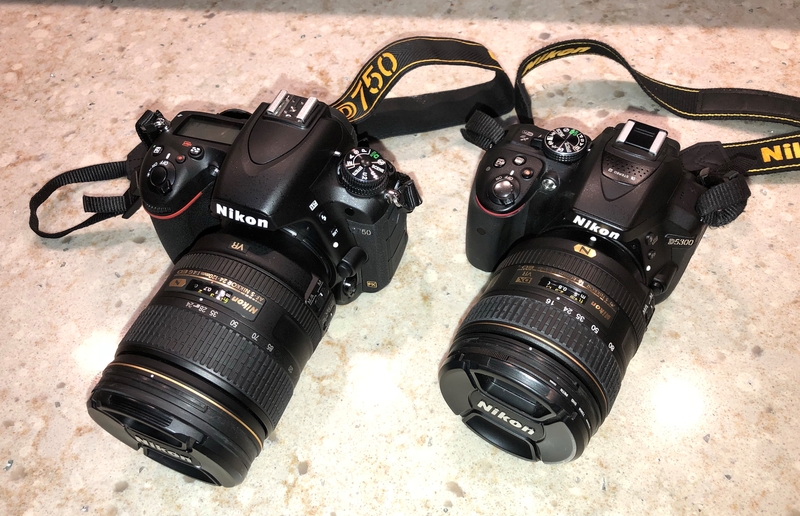 The D5300 on the right is the smaller crop sensor and the D750 on the left is the full frame. There are also other brands that make different form-factors. Olympus and Panasonic make a format called Micro-four-thirds, also referring to sensor size. These cameras are smaller and lighter and still have better performance than a phone camera as they allow you to install different lenses. These are actually pocketable and I would definitely prefer this when walking around with the family compared to my heavy D750 and lenses. The pictures in good light will probably be just as good as those taken with a bigger camera. I don’t think that the smaller point and shoot cameras offer much benefit over a modern smart phone, so I wouldn’t waste money on those. You can always go into a good camera store and hold them and try them out too. Sometimes you don’t know until you find out how ergonomic it is. You might also like checking out the Micro-FourThirds cameras. If I had lots of extra money, I’d have one of these for casually hiking or walking around.